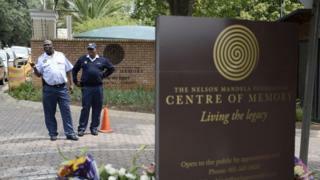 Image example Nelson Mandela Foundation say president Zuma betray Nelson Mandela dream. Nelson Mandela Foundation don accuse President Jacob Zuma of South Africa say im dey abuse di trust wey people for di country get for am and so make im resign "sooner not later". For di twitter handle of di foundation, dem tweet say time no too dey to delay so make Zuma comot. Dis foundation wey dey help promote di "values, vision and work" of di first black leader of South Africa, don chook mouth for di leadership palava of Mr Zuma through one statement wey dem bring come out on Tuesday morning. "E don reach fourteen months since di Nelson Mandela Foundation first call for President Zuma to resign. Now we don reach di point where South Africans no fit dey wait for am to do so." " Mr Zuma don "betray di country Nelson Mandela dream of dat time wey e take im first step of freedom 28 years ago"
"President Zuma don abuse di trust of South Africans. E must go, sooner rather than later. Time no dey. To delay now go lead to more of di kain violent fight wey we see yesterday. " "We dey call for calm and respect for di rule of law during all protest actions wey get to do with di President." Di pressure for Mr Zuma to resign increase recently because of di plenty-plenty corruption accuse on top im head but e dey deny di accuse say na lie.